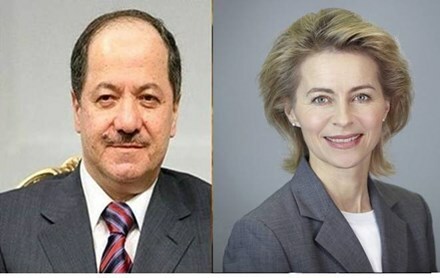 Salahadin, Kurdistan Region of Iraq, (Krp.org)- President Masoud Barzani held a telephone conversation today with Ms. Ursula von der Leyen, the Minister of Defense of Germany. During the telephone conversation, President Barzani and Minister von der Leyen discussed the political situation in the Kurdistan Region and Iraq especially the recent events. Minister von der Leyen stated that she is pleased of the de-escalation of tensions between the Iraqi and Peshmerga forces. She also expressed her appreciation and respect to the Peshmerga forces for the role that is being played in the international effort against the terrorists of the Islamic State. She added by saying that Germany will continue to support the Peshmerga forces. The conversation was concluded by the minister’s notes on the importance of negotiations with Baghdad and Erbil to resolve the outstanding issues.